As the image will show, the old Mini Max Plus pool heater was needing to be replaced. 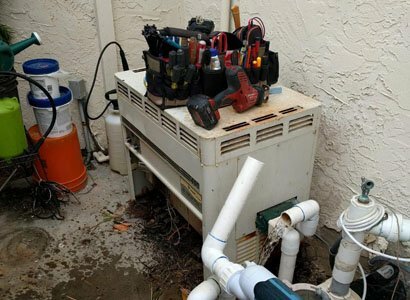 This pool heater in Del Mar, CA was rusted out through the entire bottom of the pool heater. This pool heater may have been damaged by the salty air being so close to the ocean. Likely the bulk of damage was from it’s age and standing water under the older Mini Max Plus heater. 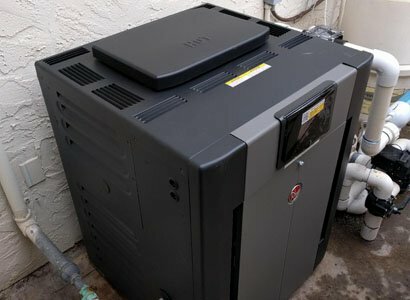 Below explains a little more information on this Del Mar pool heater installation with a Raypak 406A. We were called out to this Del Mar home to perform a pool heater repair if possible. After taking a quick look, we new that there was no way to perform any type of repair. This old Mini Max Plus pool heater was completely rusted through. Once we explained this to the customers, he was interested in Installing a new pool heater. When this happens, we send out a written estimate for the recommended pool heater replacement options. Once the customer accepted the quote, we scheduled the new pool heater installation. 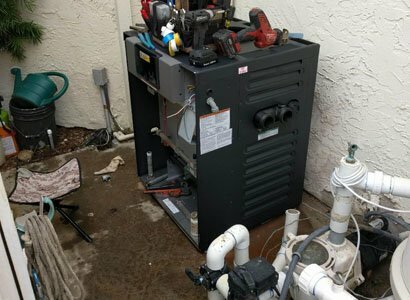 To get the new pool heater installed at this home in Del Mar, we first needed to remove the old one. The existing Mini Max Plus pool heater was cut from the plumbing, gas line removed, and wiring removed. We were then able to take the top part of the heater out to our truck for removal. Then, we needed to do a lot of sweeping and rust clean up. Our second step is to move the new Raypak pool heater into position. This allows our pool repair technician to layout the new plumbing, electrical and gas line. With all pool repairs performed in Del Mar or anywhere else, we focus on clean, professional workmanship. 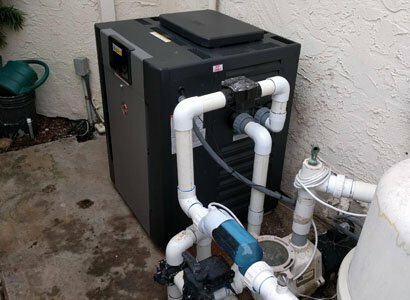 First, we will reconnect the gas pool heater line as that is the most rigid connection. Now we can replumb the inlet and outlet of the pool plumbing that included a new 2″ check valve. Our final steps for installing this new pool heater in Del Mar is to install the electrical and communication wire. Now that the new pool heater is installed, we will test for proper operation and heating. If all is working properly, we perform a final clean up and head out to the next pool repair or equipment installation job. If you live in Del Mar or San Diego County, we can help with your pool heater repairs. Or if you are looking to update to new pool equipment that saves energy and time. Regardless of your pool or hot tub needs, we service all of San Diego. Please let us know if we can help.